Italian rabbi and author; lived at Porto, in the district of Verona, and at Cremona; died Dec. 30, 1596. He was a descendant of the Rapa family, but he changed his name to Rapoport (i.e., Rapa of Porto). 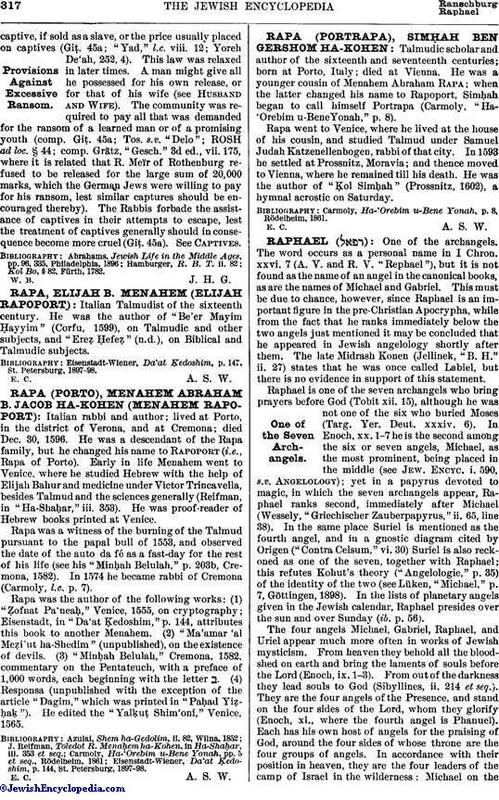 Early in life Menahem went to Venice, where he studied Hebrew with the help of Elijah Bahur and medicine under Victor Trincavella, besides Talmud and the sciences generally (Reifman, in "Ha-Shaḥar," iii. 353). He was proof-reader of Hebrew books printed at Venice. Rapa was a witness of the burning of the Talmud pursuant to the papal bull of 1553, and observed the date of the auto da fé as a fast-day for the rest of his life (see his "Minḥah Belulah," p. 203b, Cremona, 1582). In 1574 he became rabbi of Cremona (Carmoly, l.c. p. 7). Rapa was the author of the following works: (1) "Ẓofnat Pa'neaḥ," Venice, 1555, on cryptography; Eisenstadt, in "Da'at Ḳedoshim," p. 144, attributes this book to another Menahem. (2) "Ma'amar'al Meẓi'ut ha-Shedim" (unpublished), on the existence of devils. (3) "Minḥah Belulah," Cremona. 1582, commentary on the Pentateuch, with a preface of 1,000 words, each beginning with the letter ב. (4) Responsa (unpublished with the exception of the article "Dagim," which was printed in "Paḥad Yiẓḥaḳ"). He edited the "Yaḳuṭ Shim'oni," Venice, 1565. Eisenstadt-Wiener, Da'at Ḳedoshim, p. 141, St. Petersburg, 1897-98.